This month saw the Isha Yoga Centre buzzing with a wide array of events and activities. 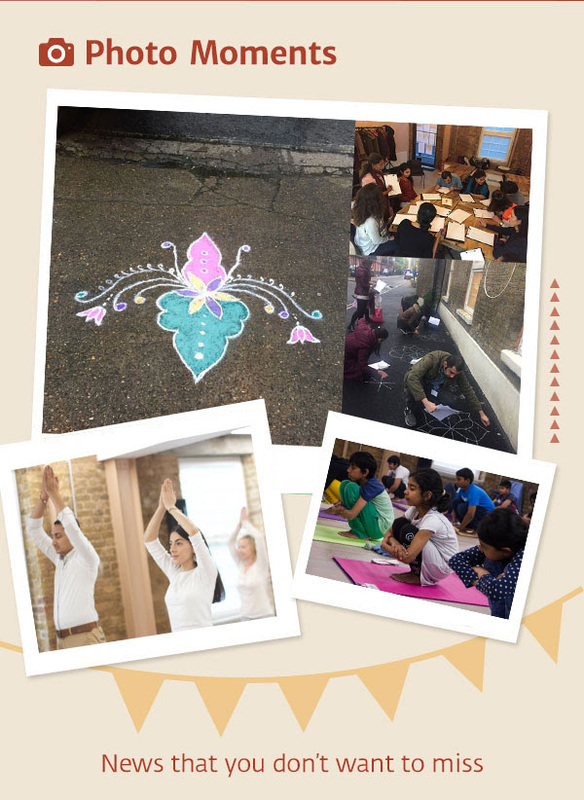 To celebrate the Tamil New Year and its coinciding with the advent of Spring, a special workshop on Rangoli design was offered at the centre. A large group of volunteers all flooded in to get their creative juices flowing and generate beautifully intricate patterns to decorate our growing home! The warmth and fervour of the attendees made the occasion truly memorable! We are especially excited to announce that the centre’s first Yoga for Children Workshop was a success! Designed by Sadhguru, the workshop instils simple tools to support the vibrancy of a young and growing body and mind through a variety of fun- filled games and activities. It was incredibly touching to see the overwhelming response of the children to the session, we all left with swollen hearts, completely charmed by their innocence and boundless energy! We were also delighted to organise three free yoga sessions this month, as part of Sadhguru’s vision to offer ‘one drop of spirituality’ to every individual. These free yoga workshops are holistic sessions that focus on empowering attendees with simple but potent practices for overall health and to help them cope with the disorienting pace of modern life. All the sessions were well received by the first-time meditators, kindling their curiosity to further explore other Isha programmes! Free sessions are a wonderful opportunity to spread the tools for self-transformation and to share this process with family and friends to get them acquainted with what Isha offers. 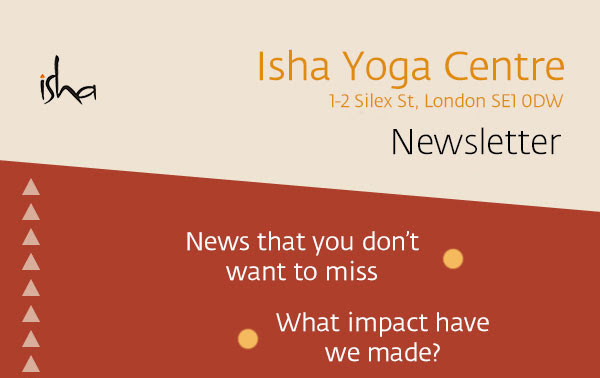 If you are interested in getting involved in our mission to spread the word about Isha free offering sessions then please feel free to write to us onoffering.europe@ishafoundation.org. and finally, we are thrilled to announce that Guided Shambavi Mahamudra Kriya Sessions and Sadhguru Presence Time will take place every Wednesday and Friday from 5.45pm to 6.30pm at the centre. Presence time commences at 6:20 PM and ends at 6:30 PM every day. It is the most conducive time to connect to Sadhguru’s energies and receive his grace. We are very privileged to be able to offer this possibility in the very favouring and powerful space of the Isha Yoga Centre London and do hope you make use of these life-altering opportunities. 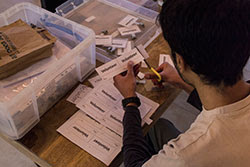 This April, we offered three Inner Engineering Programmes at the centre, with people from differing countries and all walks of life energetically participating. We are thrilled to announce that since the beginning of the year more than two hundred people were touched by the inner engineering programmes in the centre. Four Isha Hatha Yoga Programmes also took place in April, led by highly trained teachers, who present Hatha Yoga in its purest form as a means towards cosmic union. The Yoga for Children Workshop reached full capacity, and the Angamardana, Buttha Shuddhi and Surya Kriya workshops were all well attended! 4:00​ - 6:30pm Sathsang starts with ​Shambhavi Mahamudra Kriya. Those who have attended the Inner Engineering Online and have not been initiated into Shambhavi Mahamudra Kriya can attend from 4:30 to 6:30pm. Contribution: Please account for £10 to cover expenses. For directions on the day please call Dave on +44 77203 18350. There is no intelligence like the body. This body, time after time again has proven its capacity to heal. Being chronically sick ironically tends to turn me away from the body, all my breath and energy is redirected to an anxious mind instead of to the body, where it’s needed most to truly convalesce. Sometimes the body recovers but the mind keeps it suffering. Through listening to Sadhguru, I learned that acceptance of pain is what prevents me from being further conditioned by it, that in accepting and understanding our pain we are no longer suffering it, but actually celebrating and transcending it. I am a survivor, learning that all life is not survival, but love. There is no need to be alone or afraid. This is what Sadhguru instilled in me. A combination of practices offered to me through Isha has been helping me effectively realign a wayward mind and care for the neglected body. Simple things like lighting a candle, taking a sip of water and being involved with this body and this world, have really opened me to its joy. Sharing the warmth of the journey and volunteering with the growing family of the Isha Yoga Centre London constantly keeps my life turning into a petal of grace.